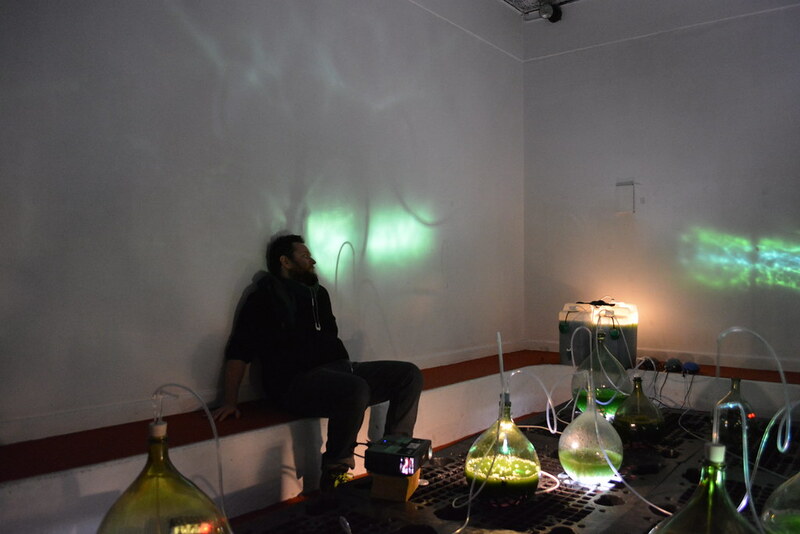 Viridarium is an installation composed of glass jars, sound amplification, projectors, various electronics, bubblers, laboratory glassware. 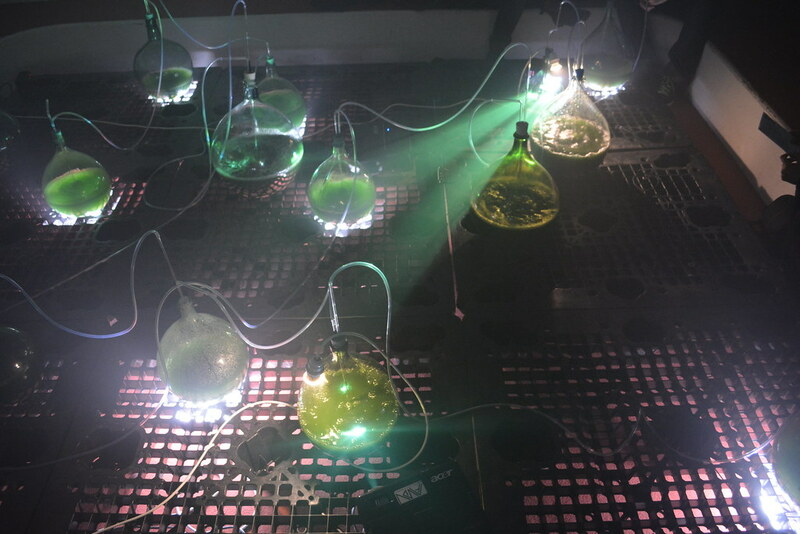 This project has been achieved with Louis Clement, Damien Duguay Mathieu Bertrand, Theophilus Thomas, Peter Herman and many others. 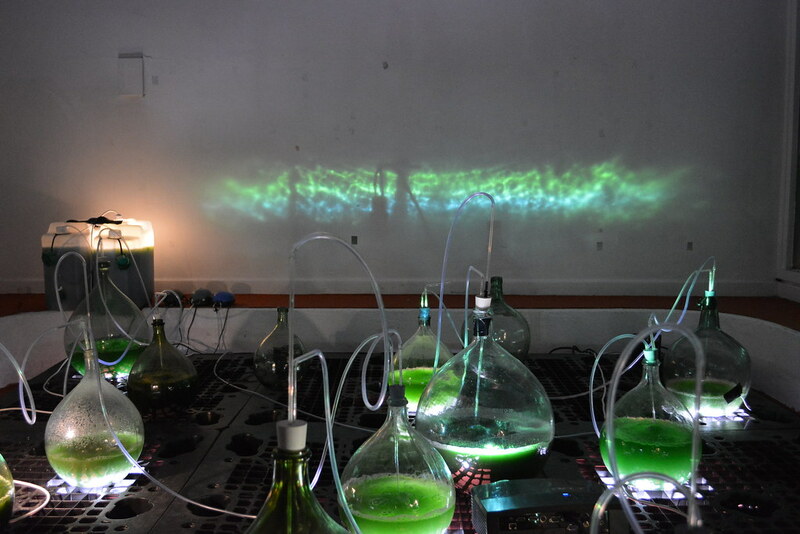 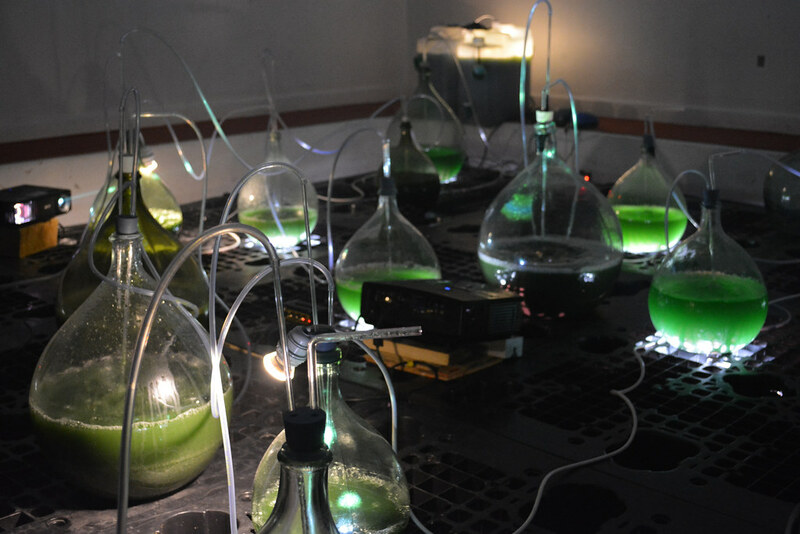 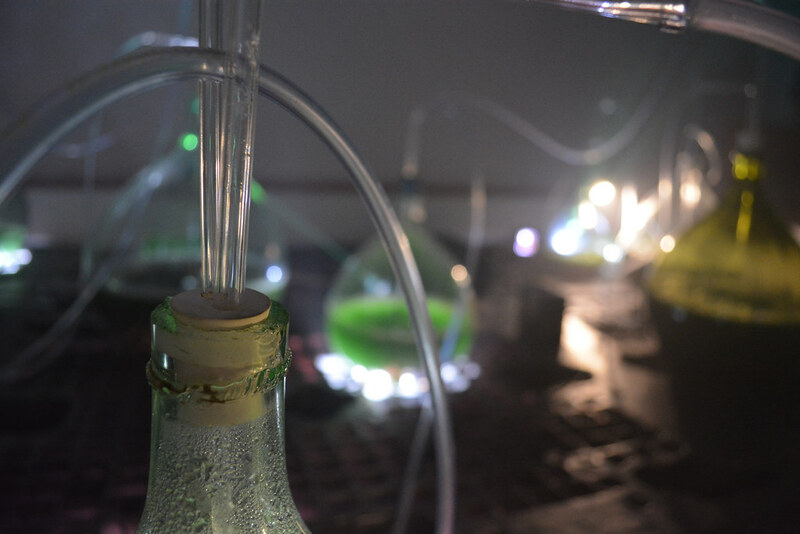 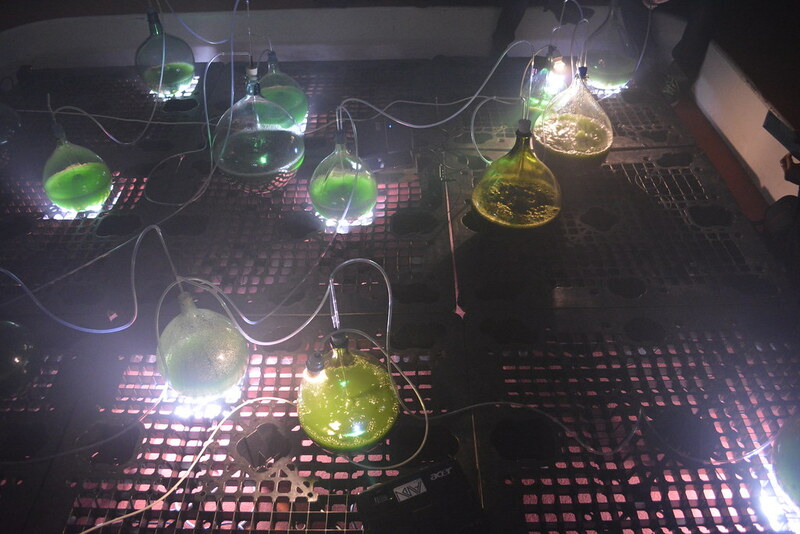 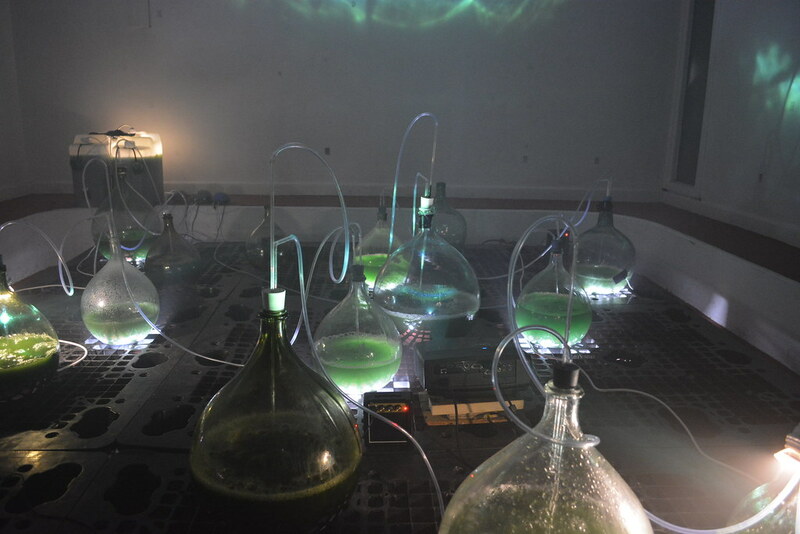 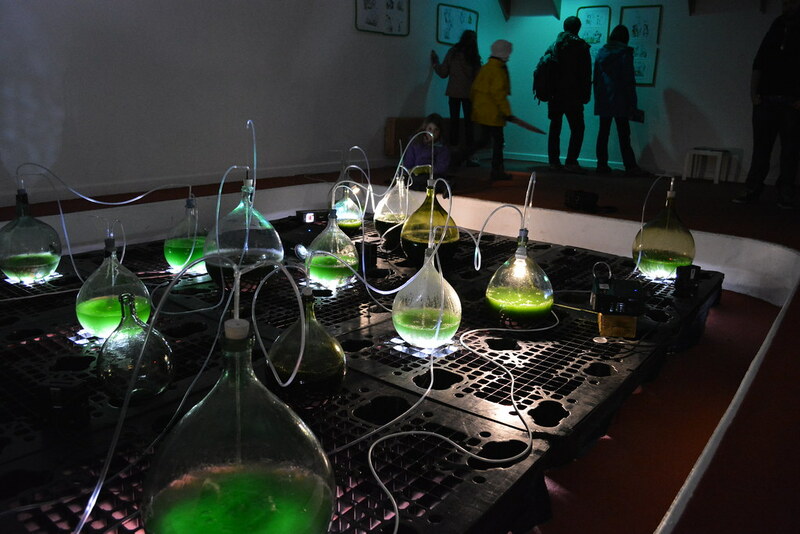 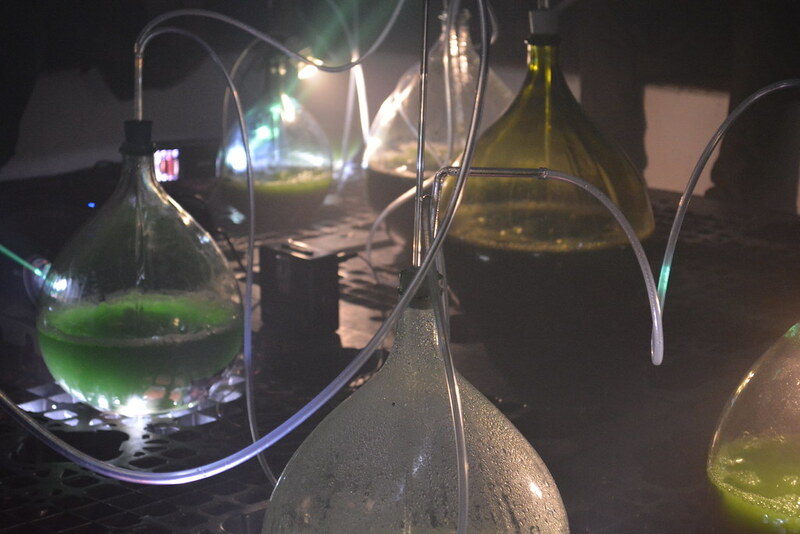 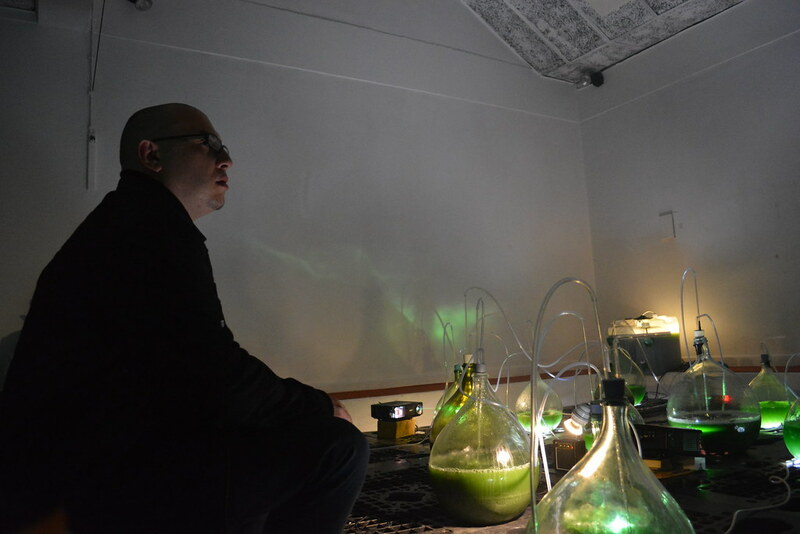 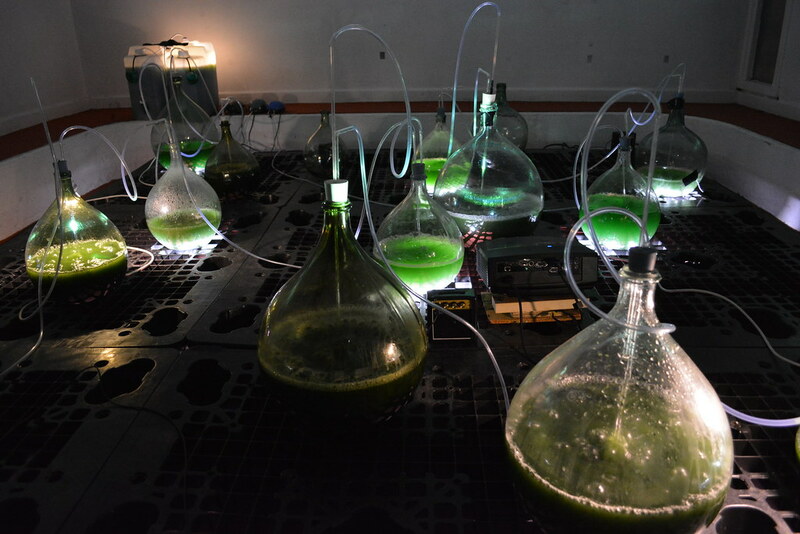 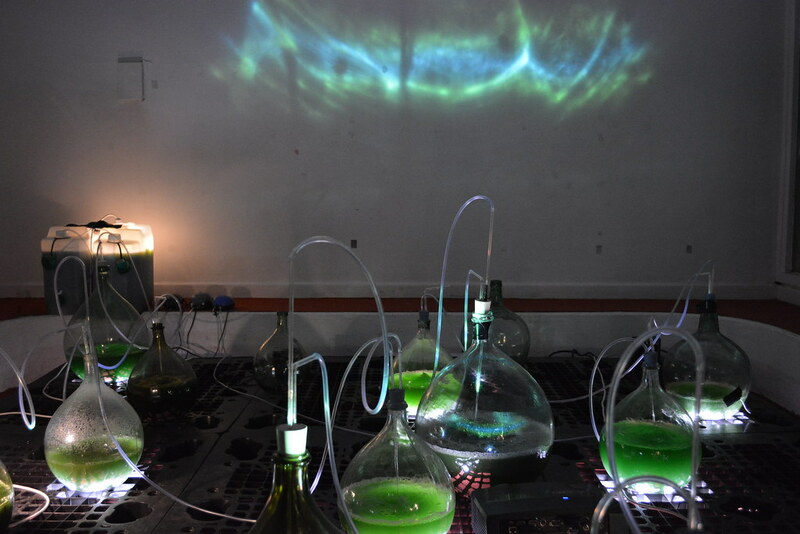 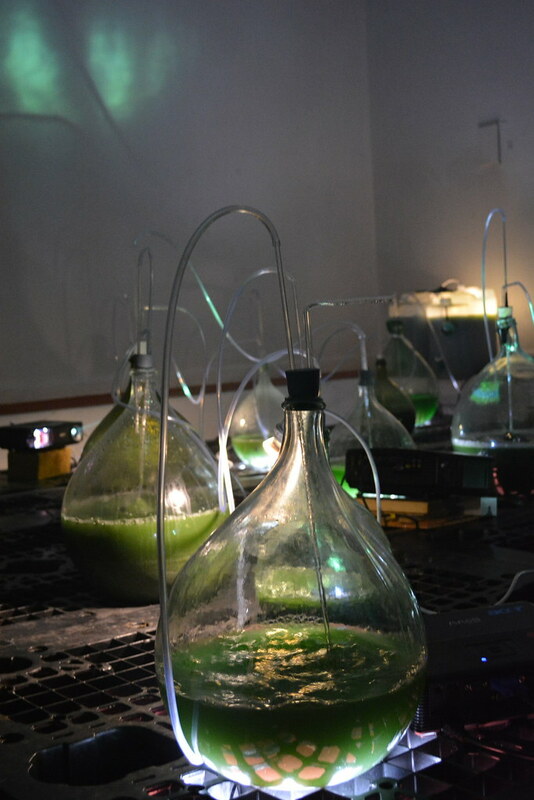 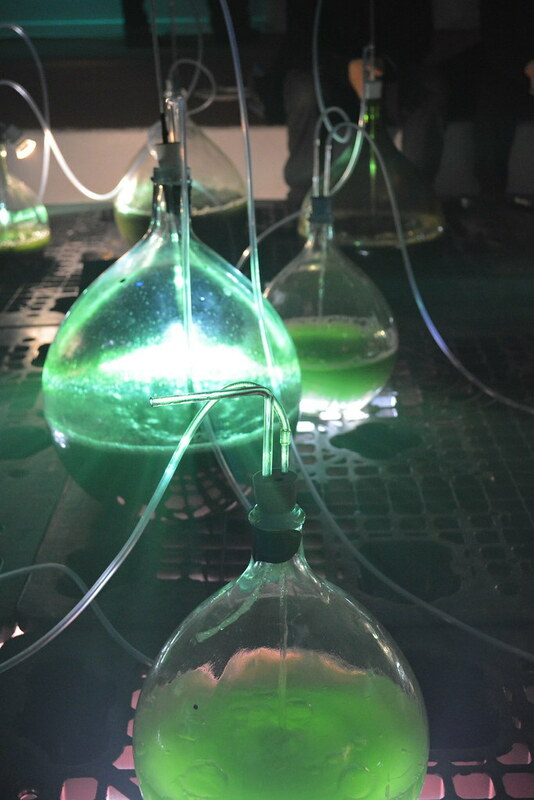 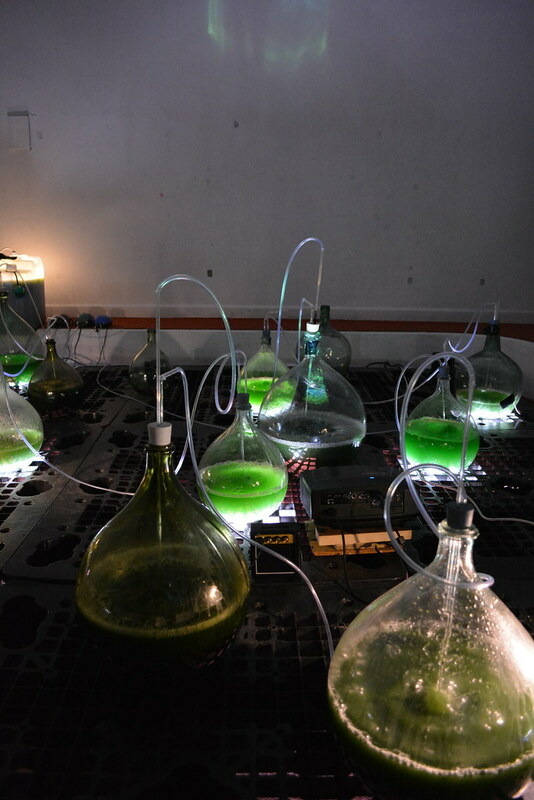 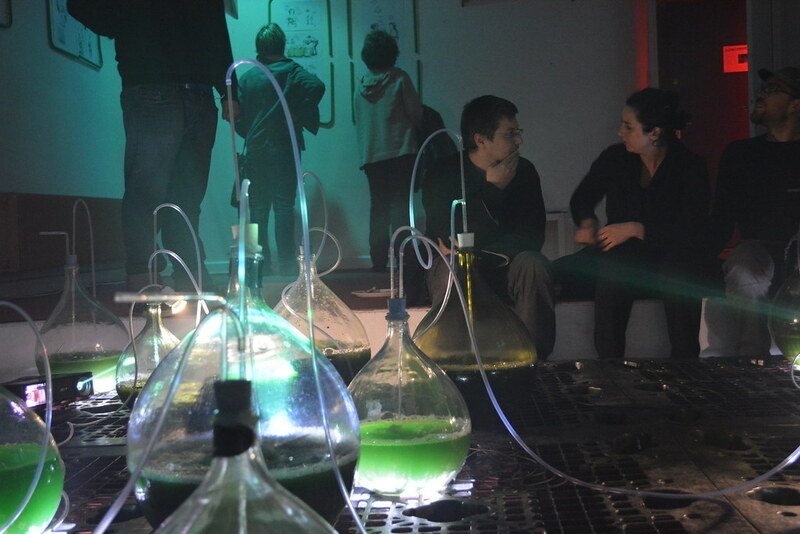 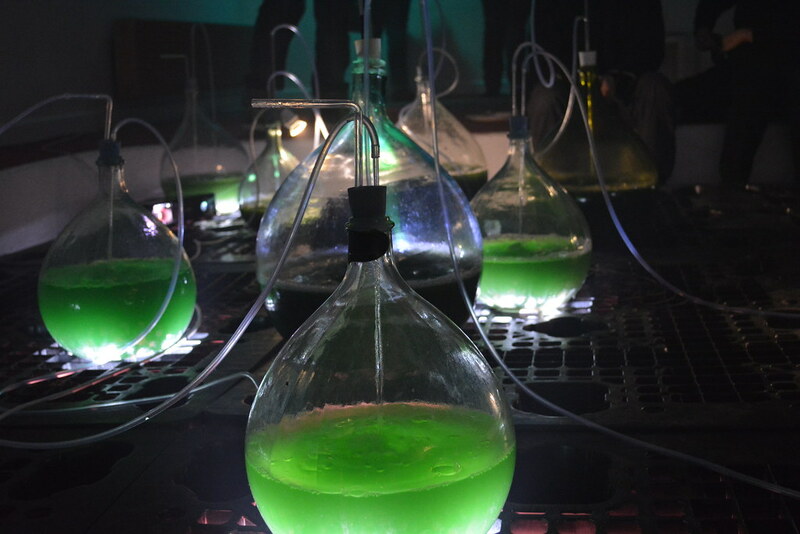 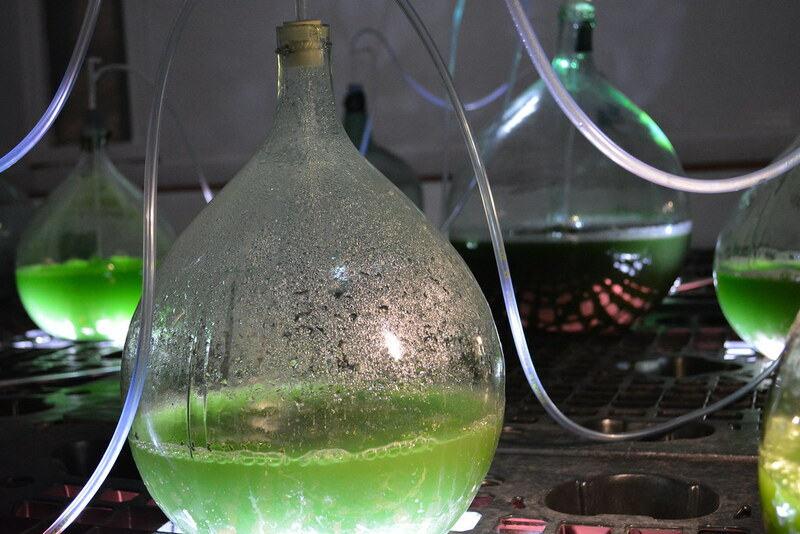 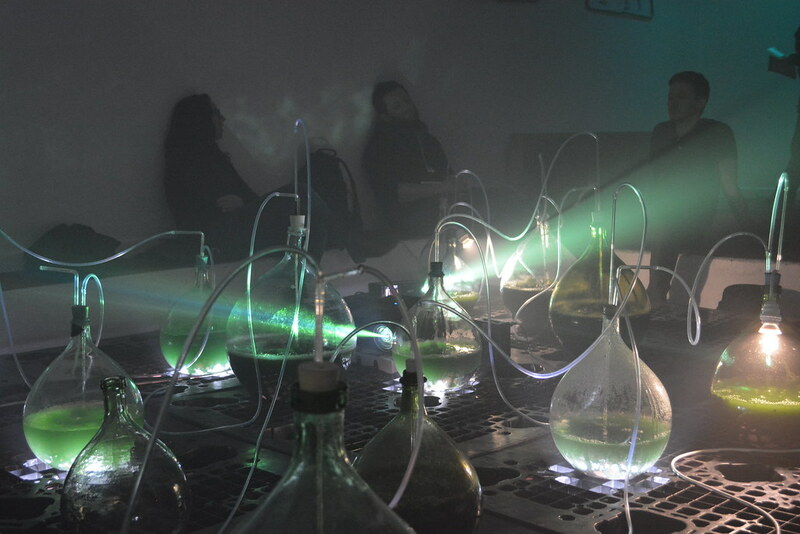 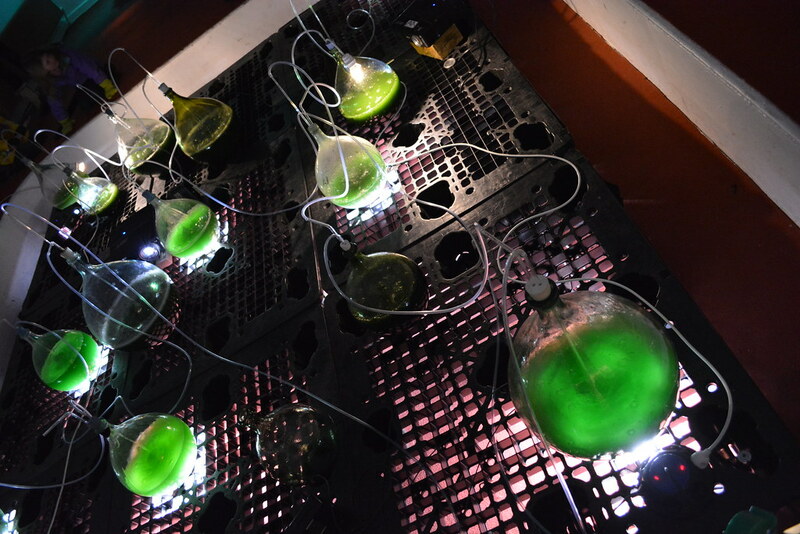 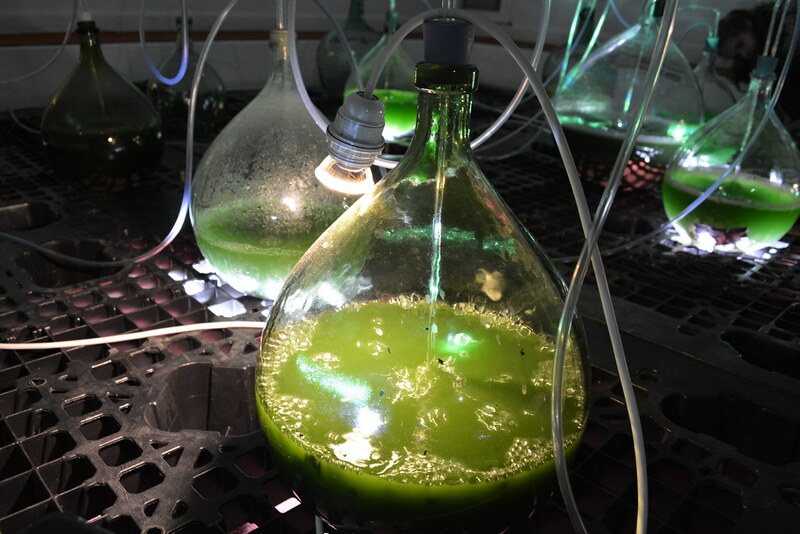 Viridarium or the spirulina bioreactor is a collaborative project silhouetted in the continuity of the project started in 2013-2014 by Art-Act with the spirulina farm. 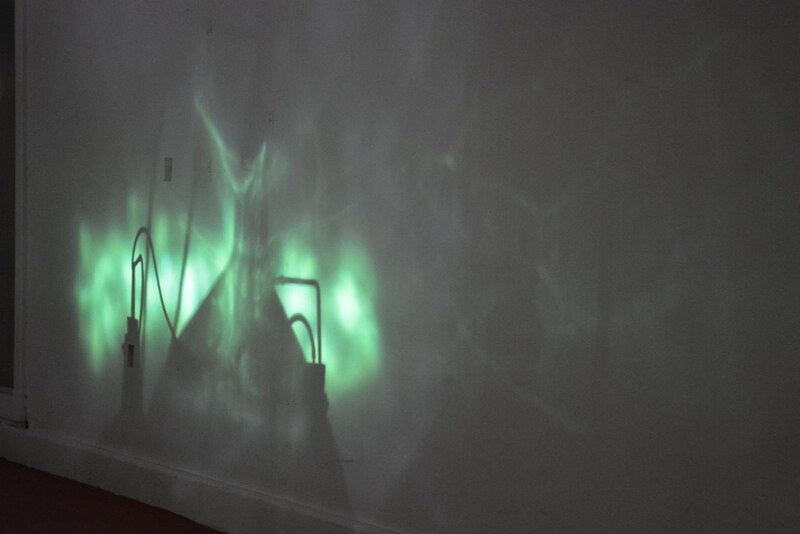 It was designed as part of a residence standing in March 2014, at the lablab of AADN. 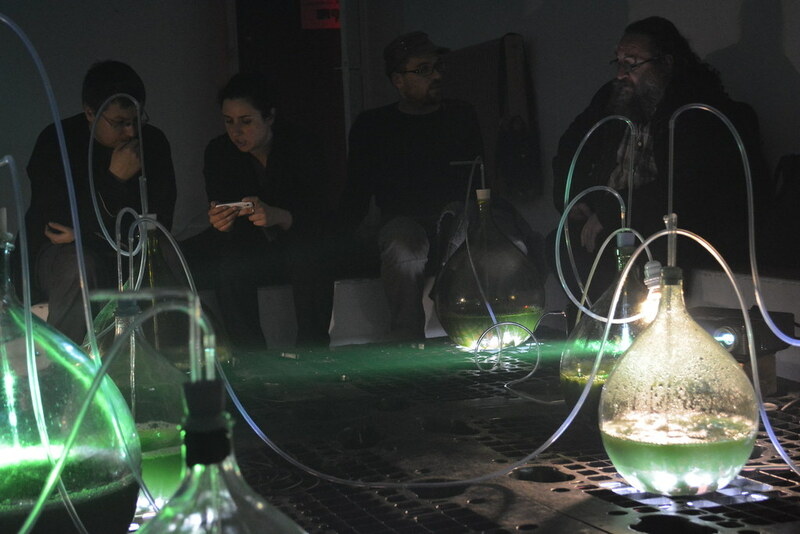 The participants were from all sides (aquarists, designer, scenographer, visual artists, designer …) and favored recycling and low-tech innovation. 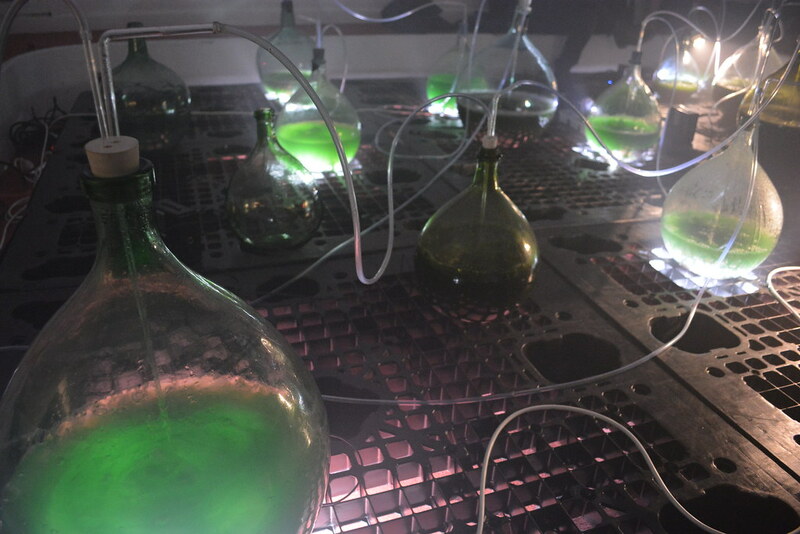 The ‘dame-jeanne’ (name given to the glass bottles) are usually used to store wine, oil or alcohol. 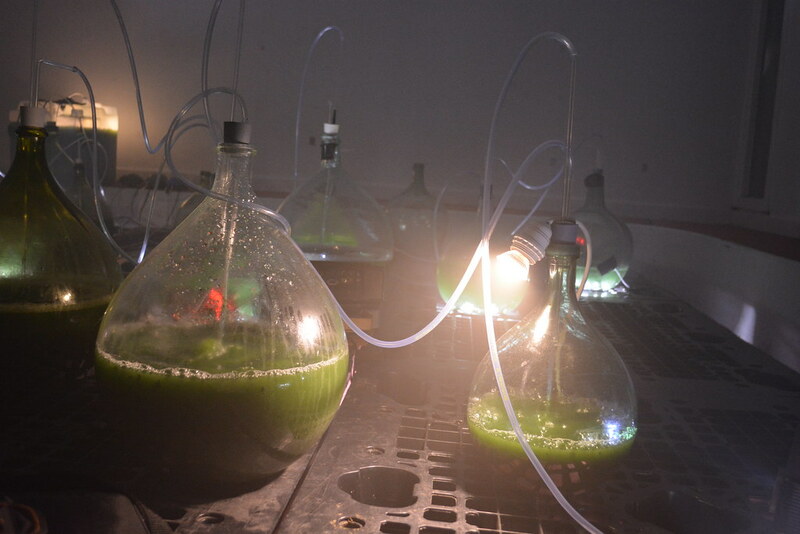 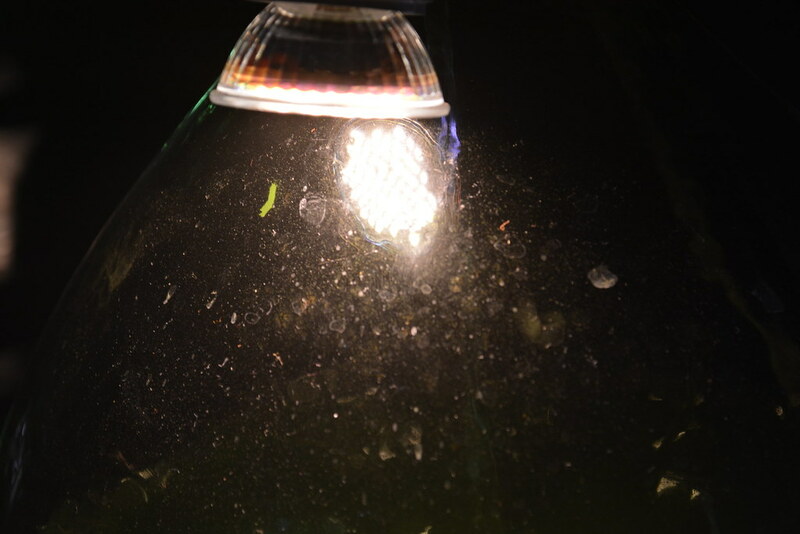 Recovered in various places and cleaned, they received a strain of spirulina cultivation and whose development factors have been controlled (light, heat, bubbling). 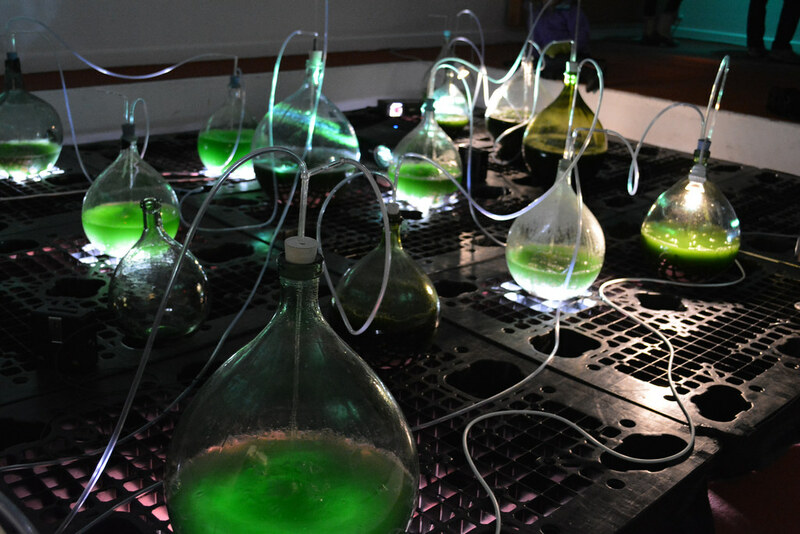 Viridarium is part of the project for the spirulina farm and undertake a reflection on the possibilities for installation in space, even spirulina. 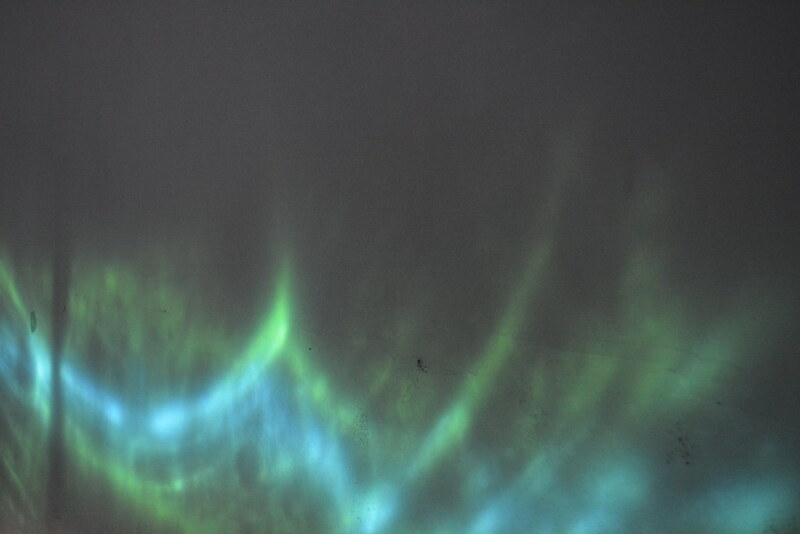 The sound dimension is important. 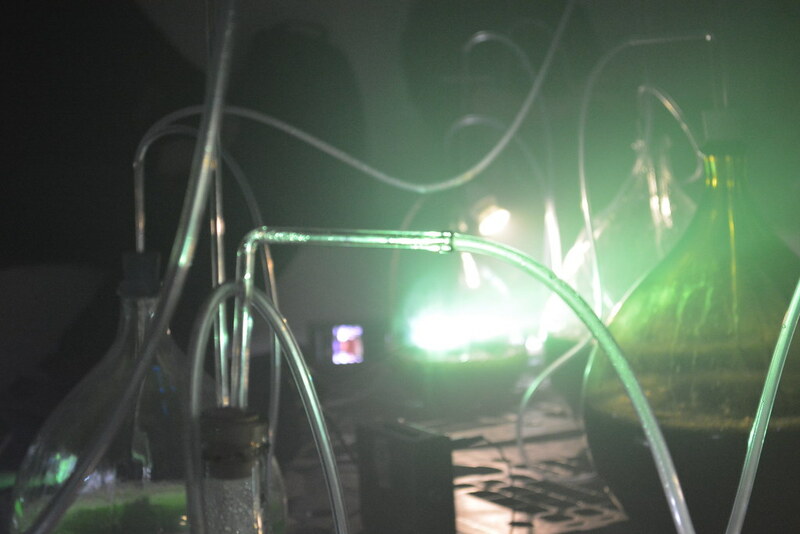 Each of the cylinders is amplified by means of a piezo connected to an amplifier. 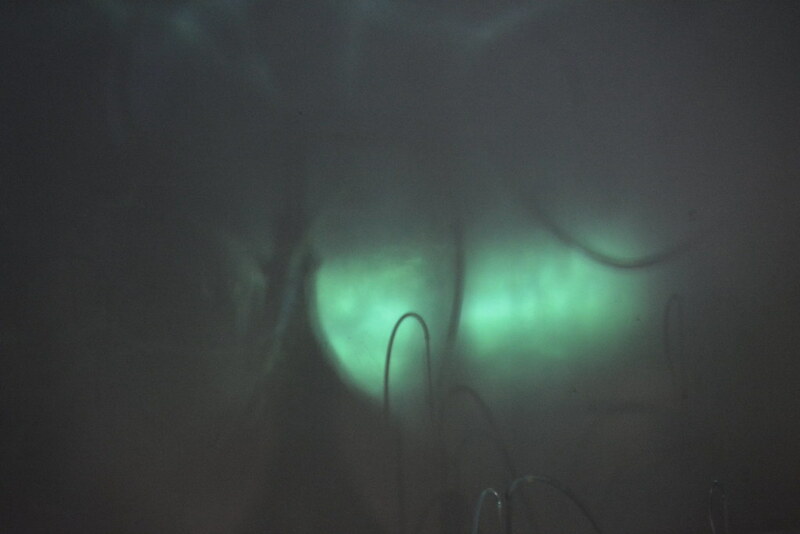 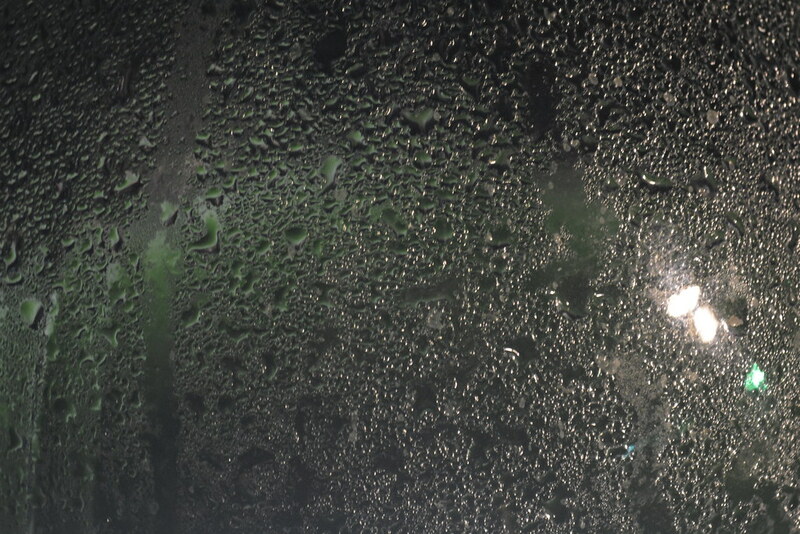 The bubbling in contact, glass walls produces crystal clear sound effects and which sometimes results a larsen feedback. 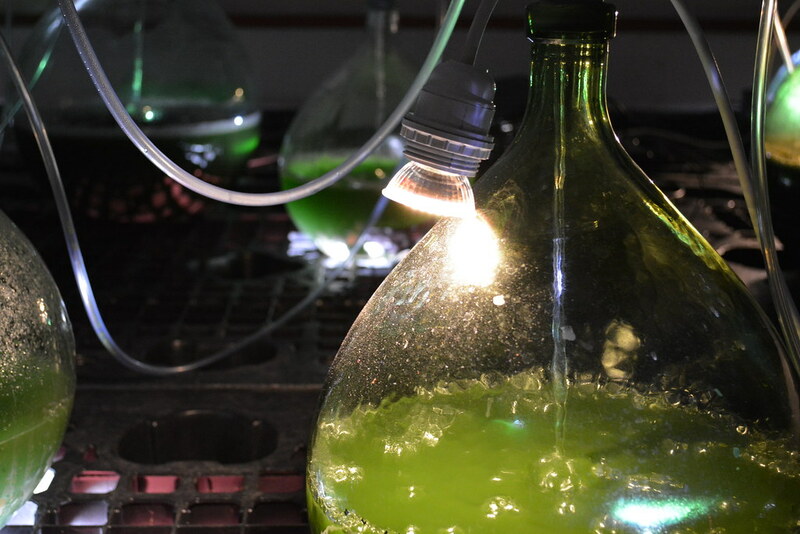 Le projet La ferme à spiruline est cofinancé par l’Union européenne dans le cadre du FEDER, la DRAC Languedoc-Roussillon et la Région Languedoc-Roussillon dans le cadre du Fond de soutien à la création numérique. 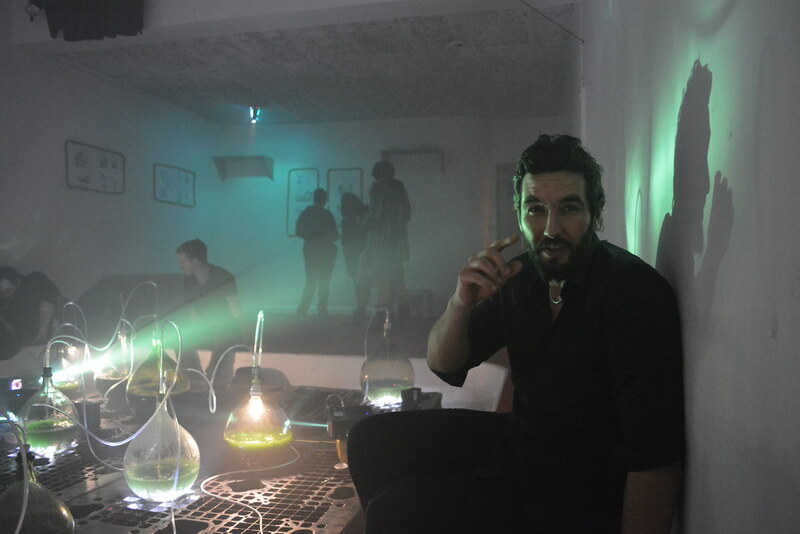 Avec le soutien du Conseil général du Gard et de la ville du Vigan.